The Thai Health Promotion Foundation (THPF) used child actors to get adult smokers to think seriously about taking their own advice on the effects of smoking. In the Thai cultural context, adults naturally take action to educate children whenever they misbehave. However, when adults themselves repeat the children’s action, they overlook that misbehavior. 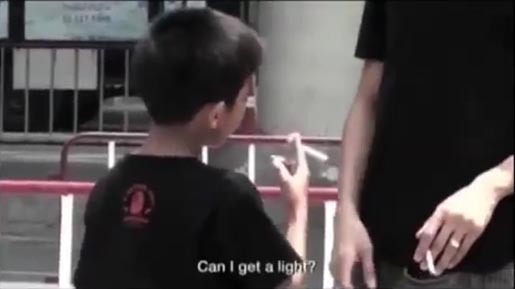 Children carrying cigarettes approached adults in smoking areas outside busy buildings, asking for a light. Adults commonly refused and warned the children not to smoke. The children asked the adults why they themselves were smoking and gave them a “quit smoking” brochure. The campaign won a Bronze Outdoor Lion at Cannes in 2012, Gold Special Event and Silver Online awards at the 2013 Clio AWards, Gold for Special Service at the One Show Awards, a Silver Film Lotus at the 2013 Adfest Awards. Inquiries increased by forty percent. When the video was uploaded in YouTube, number of views reached over 600,000 views within three days and over 5,000,000 views within 10 days, gaining the attention of Thailand’s top TV programs along with international coverage on Al Jazeera, Reuter, New York Daily News, Arab News, Chicago Tribune, Fox News, Deccan Chronicle from India, Philstar from The Philippines. The Smoking Kid campaign was developed at Ogilvy Thailand, Bangkok, by chief creative officer/art director Nopadol Srikieatikajohn, group executive creative director/art director Wisit Lumsiricharoenchoke, creative directors Taewit Jariyanukulpan and Prasert Vijitpawan, copywriters Nopharit Dusadeedumkoeng and Kris Garford Spindler, art director Asawin Tejasakulsin, managing director Phawit Chitrakorn, agency producer Uravasee Chuturonggukul and account supervisor Patsa Attanon. Filming was shot by director Kittithat Tangsirikit with director of photography Nunthapan Swangdee, producer Tatcha Ngamkala and editor Dear Charungkhon. Sound was produced at Sound Suite Studio.